DETROIT -- Ford Motor Co. is selling a Michigan fuel-tank factory for an undisclosed amount to Inergy Automotive Systems LLC, a unit of France's Cie. Plastic Omnium SA. The sale is scheduled to close June 1, Ford said Thursday in a statement. The factory, in Milan, Mich., will eventually be closed and replaced by a new plant Inergy will build in southeast Michigan, Ford said. Most of the plant's 500 workers will be offered jobs with Inergy or with Ford, said Della DiPietro, a Ford spokeswoman. The plant was one five remaining factories of the 17 that Ford took back as part of a 2005 bailout of its former auto parts subsidiary Visteon Corp. Ford plans to close an Indianapolis steering-parts plant within 12 months and has three other former Visteon factories up for sale. The price of the Milan plant "is not material and will not be disclosed," DiPietro said. "We are delighted to announce the sale of our blow-molded fuel tank business to Inergy," Mark Blair, president of Automotive Components Holdings, the unit Ford created for the former Visteon plants, said in the statement. "This is another important step in our strategic plan for Automotive Components Holdings." The Milan plant will be phased out over three years as production and workers move to the new facility, Ford said. About 200 of the plant's 430 hourly workers belong to the UAW and are eligible for jobs at Ford factories, DiPietro said. Inergy is at least the second buyer that emerged for the Milan factory. In December 2006, Ford said it had reached a memorandum of understanding to sell the fuel-tank plant to Flex- N-Gate, which the automaker described as an "international and privately held company with numerous manufacturing operations in several countries." The Flex-N-Gate deal fell through in early 2009 because "economic conditions at that time were not favorable," DiPietro said. Inergy did not immediately respond to an e-mail and phone call seeking comment. Its U.S. headquarters are in Troy, Mich., and it has a manufacturing operation in Adrian, Mich., according to its Web site. Ford in 2000 spun off Visteon, once the second largest U.S. auto parts maker. Even with Ford's attempt to rescue its former unit in 2005, Visteon filed for Chapter 11 protection in 2009. Visteon emerged from bankruptcy Oct. 1, 2010, after paring debt by $2.1 billion. By returning plants and offices to Ford in 2005, Visteon shed responsibility for 18,000 workers represented by the UAW. That allowed Visteon to lower its average hourly wage to $18 from $38. 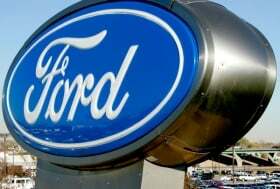 The company closed or divested 30 factories or units from 2006 to 2008 and trimmed its reliance on Ford to 28 percent of sales in 2009 from 88 percent in 1999. Visteon has reported one annual profit as an independent company.